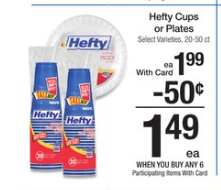 Kroger: Cheap Hefty Plates after sale, coupon and rebate! Just in time for the long weekend celebrations!!!! Hefty is as part of the Buy 6, Save $3 sale at Kroger! We have coupons and this morning Savingstar released a rebate too making it even cheaper!